It's regrettable that the Public of Theni District, especially Bodi are not demanding strong enough for early completion of Madurai - Bodi B.G line .it seems even the local traders association too , are neither serious nor much interested, to have railway service early to their place. as beneficiaries , they too should press for this crucial demand. expectation is that..... will they? A group of rail fans celebrated the 39th birthday of Train Numbers 12635/12636 Madurai-Chennai Egmore-Madurai Vaigai Superfast Express on Monday morning. 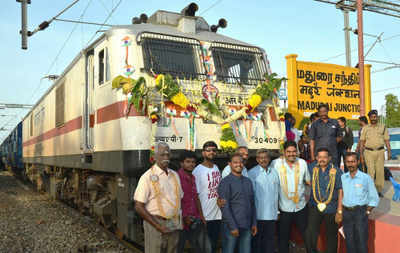 The team reached Madurai junction early on Monday and started decorating the locomotive of the Madurai-Chennai Vaigai Express train with garlands and colour paper. They garlanded the loco staff and presented them mementos. After the function, the team travelled in the same train till Villupuram. After a brief while time, they travelled back to Madurai by the Chennai Egmore-Madurai Vaigai Express. When the train reached Dindigul junction by evening, the seven-member team, consisting M Arun Pandian from Bangalore, S Gokulnath from Namakkal, N S Pradeep from Mysore, S Ravi from Bangalore, Pragatheesh S K from Chennai, Ranga S from Trichy and Anand Subramanian from Hosur, surprised passengers at the C-1 coach by cutting a cake and distributing it. There was one more cake cutting ceremony at the Madurai junction where there is a brass board marking the first train service of the Vaigai Express that started on August 15, 1977. The cake was designed like a train. "Among the trains, Vaigai Express is our favourite because it was one of the fastest mode of travel between Chennai and Madurai before road transport evolved to this scale," said M Arun Pandian, a software professional and ardent rail fan. During the cake cutting, the rail fans also honoured retired running staff of the Vaigai Express as token of gratitude. "It was heartening to see such a gesture from rail passengers," said retired loco pilot D Krishnan who used to pilot the Vaigai Express. "We keep demanding so many trains and amenities from railways every time. Why not celebrate what we have at hand," Arun added. Rail journey in Pandian Express, the flagship train of Madurai Railway Division, will not be the same any more. For the superfast train has got a pair of LHB or Linke Hofmann Busch rakes. Divisional Railway Manager, Sunil Kumar Garg, flagged off the first train with LHB coaches that come with German technology, here on Monday night. Indigenously manufactured in Rail Coach Factory in Kapurthala and Integral Coach Factory, Chennai, the coaches are approximately 1.7 metres longer than the conventional ICF coaches, said Senior Divisional Mechanical Engineer, Jay Prakash, said. “This provides more seating capacity with wider bays and doorway,” he said. The coaches come with additional berths – 80 berths in sleeper class (instead of 72 berths); 24 in First AC (18/20); 52 in II AC (46), – and 100 seats in general compartment instead of 90 in conventional coaches, he said. “These coaches have more stainless steel and thereby the weight of the coach is approximately 10 per cent less than the conventional coaches,” he added. This will enable the trains to run faster matching the track speed. With no electrical facility in the undergear of the coaches, the rakes come with generator cars on both ends. “The independent generator cars will reduce the burden on the locomotives for power requirement of the coaches,” Mr. Jay Prakash said. These coaches are fitted with microprocessor-controlled high capacity air conditioning system, which gives passengers better comforts during summer and winter season. The steel body will also ensure lesser corrosion and easier maintenance with longer life. The coaches also have axle-mounted disc brakes that will give superior braking power in reducing the speed or stopping the train quickly. Higher usage of steel provided better aesthetic look to the coach that has better interiors with large windows, steel wash basins in and outside the toilets. The coaches have been designed with lesser noise inside. It has anti-skid PVC flooring. Besides, the Fiat technology used in LHB coaches is both heat and cold resistant. The new technology consumes less energy while creating heat and cooling effect in these new coaches. The controlled discharge toilet system (CDTS) in LHB coaches is an added advantage. The windows are wider and each coach has a pantry provision. The railways has partially modified the design of these coaches to fulfil the needs of passengers. Instead of the emergency alarm chain, the new coaches come in a new design which will identify the bay from where the alarm was used. The Additional Divisional Railway Manager, P.V. Murali Krishna, was present. Thanks and kudos to the railway dept for providing new high-tech coaches for the prestigious Pandyan Express. similarly the legendary 'Vaigai Express" too needs to be upgraded, in keeping with the times. With Madurai Junction reaching the saturation point of train operations, Kudal Nagar railway station on the outskirts will become a coaching hub and secondary terminal. According to railway officials, Southern Railway headquarters has given its nod for the project, which will be executed at a cost of Rs 30 crore. At present, Madurai station handles more than 50 passenger trains on a daily, including 19 originating and terminating trains. Occasionally, freight trains too pass through the junction. With six platforms, there is difficulty in handling trains during peak hours. 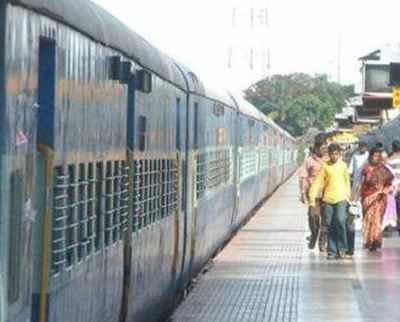 At least two to three times in a week, trains have to be detained on the city outskirts like Kudal Nagar or Tiruparankundram during peak hours due to adequate platform facilities. Considering future requirements, Kudal Nagar will become a coaching hub for the city, said divisional railway manager, Sunil Kumar Garg during a recent media interaction. "There is no place in the junction to accommodate any new trains. So we have to develop Kudal Nagar as the next terminus where trains towards Trichy could originate and terminate as that part of the city is developing fast," he said. Situated 2 km by rail and 6 km by road from Madurai Junction, Kudal Nagar at present hosts as a goods yard. It was announced as Adarsh station few years ago and has lot of vacant land available for development. The division utilised this station to operate originating and terminating trains when the yard was closed for works in 2012. Even then there was demand among rail users to consider it as secondary terminus for the city. good, let kudal nagar become a terminal soon. Does anyone know the fate of Madurai-Bodi B.G conversion work. it's long forgotten. It is long overdue and we are hearing about it for many years. Railway should speed up the work. State govt on its part should start shuttle bus service between Periyar, MIBT, palanganattam bus stands which should operate at regular say 10/15 minutes intervals. Railway ministries current line of thinking is to complete the ongoing projects first. Eventhough technically Madurai-Bodi BG work is an ongoing project since hardly any amount is spent, it wont be considered as ongoing project. That means, we cant expect any decent fund allocation for this project for next few years. I wont be surprised if this one doesnt get over even by 2025. Nearly 30 years back, we faced same situation but for another important project. That was Karur-Dindigul-Madurai-Maniyachi BG project. That time BG was available only till trichy. So people who wants to go to banglore had to take a bus or go to trichy and take train from there. For bombay, go to madras and take train. i used to do the same for years. Railway ministry used to allocate very meagre amount and so the project was getting delayed for years. Same is happening now for this project. Both the former and the sitting M.Ps of Madurai & Theni Distrricts have never shown any interest to provide B.G line between Madurai and Bodi. our concern is that even the Karaikudi - Agasthiampalli ( very unfamiliar place , isn't it!) is going on, while the Southern Projects like Madurai-Tuticorin line, Madurai-Karaikudi, madurai- Kanyakumari track doubling are all forgotten conveniently by the Railway board and by the Local & central politicians alike. there are many vested interests at play , to see the region around Madurai remains underdeveloped. it's an onerous and uphill task to succeed against these odds. Indian Railways Catering and Tourism Corporation (IRCTC) will set up a state of the art executive lounge at Madurai Railway Junction, deputy general manager of IRCTC V Ganapathi said on Monday. The passengers may be likely to be charged Rs 300 and a one-time food, either breakfast or lunch or supper will be provided free of cost. There will be internet facilities and photo copier machines. There will be a locker facility too. "The plan is in approval stage, and we will execute it in next three or four months," Ganapathi said. Those top honchos of Southern railways promised in 2012, kept promising and now will keep on promising ............................? about the inauguration of the Rail yatri nivas in Madurai Junction , which stands as a hapless and mute testimony to the concerned authorities' awful planning , bad execution and perpetual denial .... all rolled into one for our ...! poor MADURAI. Separate statehood is the only good way to defeat all these hurdles of denial, discrimination, sidelining, holding back, scuttling the growth and expansion of this wonderful, city of Madurai. Madurai being the Divisional Headquarters is better qualified and utterly needs an exclusive Electric Loco Shed . also Push-pull bio-diesel electric operated passenger trains should be introduced from Madurai to destinations like Dindigul, Virudunagar, Karaikudi and Ramanthapuram. will the railway authorities consider and concede to these long pending and long neglected demands from Madurai Region. Our sitting M.P of Madurai Mr Gopalakrishnan should be informed , sensitized and pressurised to make a strong pitch for the growth of more services and facilities from Madurai and Southern districts . Also the long forgotten Madurai-Bodi new broad gauge section needs to completed soon. it seems even the people of Bodi, Theni and Aundipatti have not shown interest to get the project completed soon , to get train connectivity with the rest of India. hope it is about time to start making these strong demands.